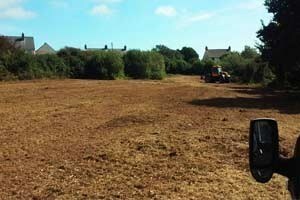 Amongst our many agricultural services operated by us, we offer Tractor and flail mower hire across Pembrokeshire and Carmarthenshire. For all land clearance or land maintenance, Flail mowers are ideal equipment to hire for those looking to clear well overgrown areas as they can cut thicker scrub than traditional mowers or handheld strimmers. Flail mowers can take brash or long overgrown grass down to a manageable level or completely down to ground level if you want to totally reclaim land. Whether you're looking to keep on top of an area of scrub land but leave enough to deter squatters and unwanted guests, or you have an overgrown piece of land that you need to clear for new developments or to use yourself as a storage area. Flail mowers are the perfect hire solution to clearing overgrown ground. 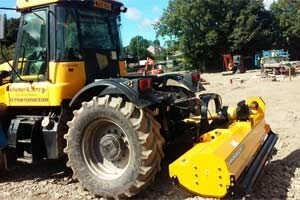 Flail mower hire is quick, cost effective and leaves a great finish to your land. Private and Commercial Hire Available. Flail Mower hire is available to private residential customers on farms, small holdings and homes. We also undertake commercial flail mowing contracts for companies and government agencies. Discounts available on long term flail mower hire.